It doesn’t have to have a hooked beak to be a predator ! 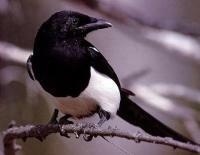 Just witnessed my second observation of a Magpie catching, killing and eating a Siskin. The first time about a year ago , the Magpie, having spotted what was in all probability a young Siskin in a low growing bush, quickly flew round and round the bush, presumably confusing and panicking the little bird, then dived in and caught it. It took it off to perch on a fence where it plucked and ate the unfortunate victim. This morning I did not see the Siskin caught but did see the same consequence for the finch. We have quite a few fledgling Siskin being fed by parents in and around the garden. Another example of the reality of nature !! We see them here, we see them there, we see the blighters every where ! 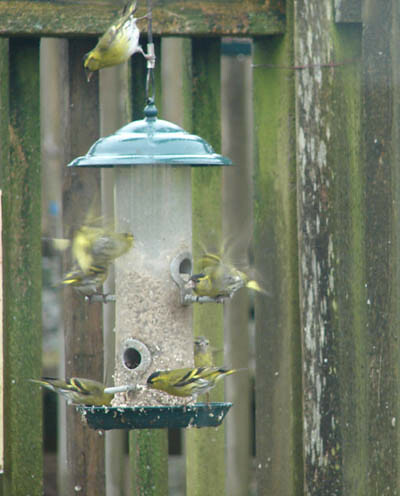 We seem to be feeding an inordinately large number of Siskins just at the moment. Not a brilliant photo taken through the back kitchen window and of course these little birds don’t stay still for very long anyway! They are feeding on both the seed feeders, as in this picture, and also the peanut feeders. Not nearly as many, but still quite a few, Goldfinch and Greenfinch here at the moment as well. Still not sign of our first Swallow, very late !! !